Sister I was so excited to hear from Trimm yesterday I forgot to give you a message from her. She ask me to tell you she is still praying for you and Connie. Hope you have a wonderful Easter. I am so humbled . . . if you talk with her again, please tell her we have been praying so much for her and her family as well. Oh yes, blessings to the messenger. Big squishy hugs for Green Eyes! Good morning, afternoon, evening, or night, Monkeys! It's morning here, how 'bout a cuppa? There's plenty here, come on, grab a cup, you don't want to see me all caffeined up, trust me! I will take two please. Must save you from the over caffination! Well dang it I missed the coffee party. Hope everyone's having a wonderful Easter eve day. Busy getting ready for Easter Dinner and getting ready for grand kids to show up to dye eggs. The two oldest do it to make Grandma happy They tell me they are to old now. But as soon as I tell them I have the eggs and dye it's when can we do it..
Wishing every one a wonderful day. May your day be filled with lots of moments of Joy and Love. Happy Easter to all! May your day be blessed! Happy Easter all!!! Christ has risen!!! 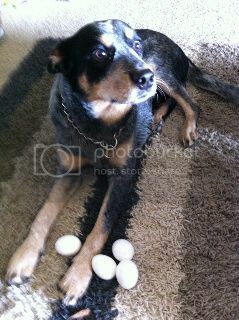 Patton collected his share of eggs this morning. Ruby was afraid of them. I am done preaching for the day -- 6:30 sunrise, 9:30 and 11 o'clock. Headed to my Mom's in a bit -- then collapse. I've been up since 2 this morning. Bet you are worn out Sister. Prayers for you, Connie and your family. Thought about you in Mass today. Click the above for the most adorable Easter video ever. Loved it Brandi Thank you for sharing. Hope every one had a great day. Have eaten so much I can't move.